February's update features an unusual circular table by the Buchschmid and Gretaux Wood Inlay Company..
Our February update brings you a piece of Buchschmid and Gretaux wood inlay furniture we have never before encountered. 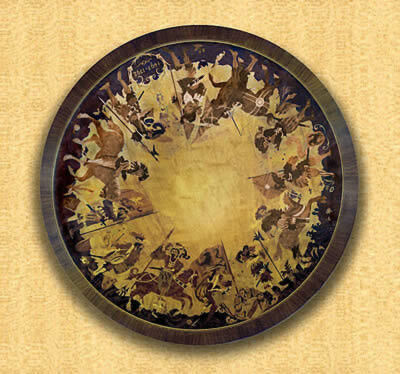 It is a wonderful round table (36" diameter - approx 90cms) which depicts the History of the World from 1497 to 1792. It is owned by Fred Johnson of the USA. As we said, this design is one which is new to us - and, it appears to be a more intricate piece of B&G work than is the norm. Whether this was a "one off" special piece made to commission, we are afraid that we don't know. Unfortunately Herr Otto Chlup who used to advise us on these matters is sadly no longer with us. This is a shame, we miss Otto's friendship and abundant B&G knowledge dearly. He is very sorely missed by us all. Nonetheless, this particular B&G round table is an excellent example of Buchschmid and Gretaux at their intricate and detailed best. We understand that Fred may soon be placing this wonderful table on EBay. So if you are looking for an unusual example of Buchschmid and Gretaux wood inlay work, this could be the online auction to watch out for. We don't know when it will be offered up for auction, that's up to Fred, but keep a watch on EBay for it. After all, this is the very first example that we have seen of this piece - is it the only one? The Buchschmid and Gretaux tables featured on pages 13 + 14 of our "Can We Help?" pages (where you are now) are reluctantly being offered up for sale. If you are interested let us know and we will put you in touch with the owner, Valery. But please note that we do not take any part in this transaction, it will be purely between yourself and the seller. We only bring you this information as a courtesy to our contributor. You will deal with the seller on a 1 to 1 basis. Click the above button to return to page 61 of "Can You Help"